I'm looking for a good Notepad replacement for the new version (2.0). This notepad replacement must be small and must read files with file sizes greater than 32KB. It also must support different languages. tis is my fav. notepad replacement. The original Notepad shipped with Windows is probably the handiest program of all times, small, fast, without frills! Notepad2 tries to follow this principle, it's a small, fast and free text editor with syntax highlighting for HTML and other common languages. 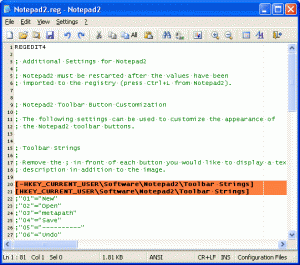 Notepad++ is a free source code editor which supports several programming languages running under the M$ Windows environment. This project, based on Scintilla edit component (a very powerful editor component) and written in C++ with pure win32 api (i.e. without MFC, that ensures the higher execution speed and smaller size of the program), is under the GPL Licence. This project is mature. However, as you can see it’s a one-man-project, there’re still some bugs and missing features. If you have any question or suggestion about this project, please drop me a mail, I’ll love to hear from you. As well, if you have any feature request, you can always do the demand, but there’s no warranty that I’ll implement it. It's GNU, 600K download BTW. i like textpad. it's not free, but has a lot of features that notepad doesn't. Ive been using Editpad lite for several months. The "lite" version is totally free, while the Pro version is pay for. There is probably a lot more Im forgetting, but that is all I can think of off the top of my head. Im not positive but I think it does support both UTF and unicode formats. Over the months Ive been using it the only thing I miss is syntax highlighting for stuff like html coding. Trying to find a text editor that the majority agrees on is probably going to be tough though. I tried easily over a dozen text editors before I finally found one that had the highest number of features/capabilities I wanted. I did give Notepad++ a try, and I think it would be a good choice. It does have syntax highlighting, but lacks the configurability of Editpad lite. Also i know that all mentioned editors weekly are released with new version - due to this any of them can not be placed into the service pack. Sorry, I know this is'nt the place but, can I rename notepad2 to notepad, makecab it and use it for an unnatended installation in XP? 3. makecab the file to notepad.ex_ and replace it on your cd. Anyone know of any editors which will allow you to copy and paste COLUMNS rather than most editors that only allow you to copy and paste ROWS? Try Context, very useful overall. So the version 2.0 will not contain any Notepad replacement. However, there was a modified version original Notepad (which has more key-bindings) in the 1.x, I think we don't need this, too.